Feverfew (Tanacetum parthenium) is an herb that traditionally has been used as an antipyretic (thus its name feverfew). In the natural products industry, marketing pressures have resulted in its common use for the prevention and treatment of migraine headaches. However, there are numerous other uses of the herb that include the prevention and treatment of asthma, rheumatoid arthritis, painful menstrual periods, and inflammatory skin conditions such as psoriasis, as well as toothache and insect bites. On the quality side, there are a variety of chemotypes of feverfew, including those that contain or do not contain parthenolide. As of the date of the publication of the AHP monograph, only parthenolide chemotypes had been found to be effective, whereas no-parthenolide chemotypes had not been investigated. 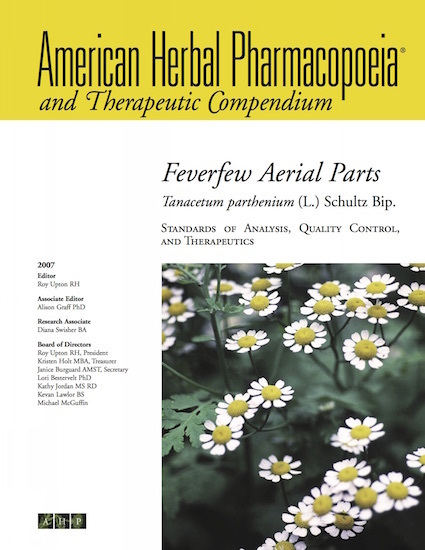 There are also concerns regarding the potential for the sesquiterpene lactones in feverfew to cause type 1 allergic reactions in sensitive individuals. The available data regarding this is presented.